Looking for something unique for loved ones this Christmas? 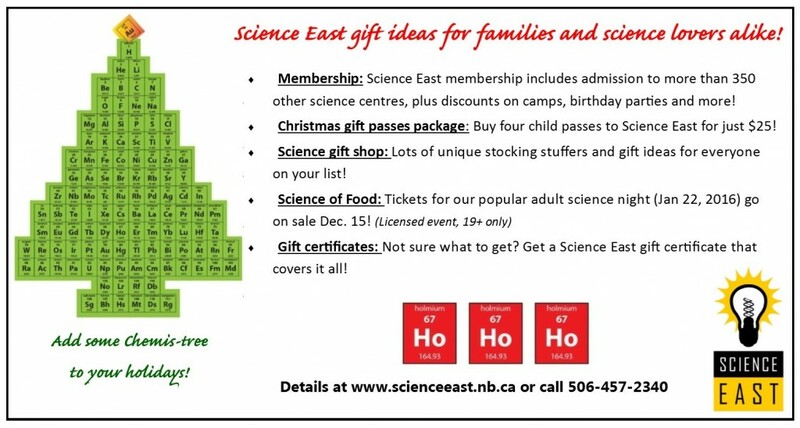 Start your shopping at Science East! We have something for just about everyone – from memberships, to workshops and events, to all kinds of neat science-based products in our gift shop! Christmas Gift Passes: New this year! Get 4 child passes to Science East for just $25, designed with our fun, festive theme! Must be purchased in person at Science East, or over the phone at 506-457-2340. Science of Food: Science East’s popular science night for adults is back on Jan 22, 2016 as part of FROSTival! Just $15 per person, this event promises some tasty treats, cool science and perhaps a beverage or two! Tickets go on sale Dec 15 – must be purchased in person at Science East, or by phone at 506-457-2340. This event always sells out, so don’t wait too long to buy! Science Gift Shop: From unique stocking stuffers to eye-opening presents that are sure to delight and inspire! Come to Science East to see our selection in person! Gift Certificates: Give the gift that covers it all! Science East gift certificates are available in the denomination of your choice – must be purchased in person at Science East, or by phone at 506-457-2340.